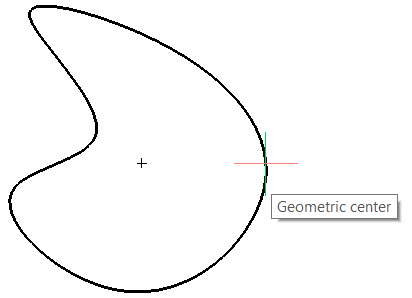 Toggles Geometric Center Entity snap; snaps to the centroid of a closed polyline, spline, planar 3D polyline, regions, or planar face of a 3D solid. Displays no prompts in the command bar; as you move the cursor over a closed entity, displays a blipmark (+) at the geometric center icon. Entering the command toggles Geometric Center entity snap. When on, it snaps to the centroid of a closed entity or and planar face of a 3D solid.